Arnold William Bobick, Lieutenant Commander, born April 7, 1919, Bowlus, MN, completed high school and joined USN Nov. 16, 1937. Military stations were the USS West Virginia, LST-958, USS Stentor and Korea. Memorable events include waiting for transport aboard the USS Arizona Dec. 6, 1941, and having two brothers aboard the USS West Virginia, Dec. 7, 1941. They all survived. Transferred to the USNR and was recalled for the Korean Conflict. He retired in 1979. He received all the usual awards and the Pearl Harbor Survival Award. His first wife Mary died of cancer. He then married Betty in 1988. He has three children, 13 grandchildren and 10 great grandchildren. He worked for the county of San Diego as a maintenance supervisor. He lives in El Cajon, CA. He owns three horses and enjoys horseback riding. 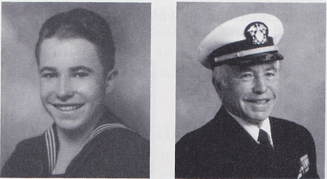 Arnold's brothers Elmer and James were also Pearl Harbor Survivors aboard the USS West Virginia.